The Latvian Flag features 3 stripes in the colors of red, white, and red. The white stripe is half the size of the two red stripes. The Latvia flag was originally adopted on January 20, 1923 and used until 1940 when it was occupied by the Soviet Union but was re-adopted again on February 27th, 1990. According to the "Rhymed Chronicle of Livonia," the Latvia flag actually dates back to 1279 (which makes it one of the oldest national flags). The Rhymed Chronicle of Livonia documents the history of Latvia and Estonia and refers to the use of the flag during 1279-1280 and states that a Latvia leader was injured during a battle and a white sheet was wrapped around him, with the two edges of it being covered in his blood. 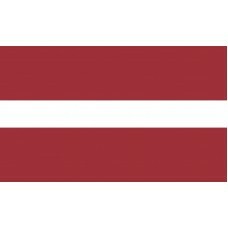 The white stripe on the Latvia flag represents the sheet and the two red stripes represent his blood on the sheet. Another interpretation of the colors used is that the red represents the "readiness of the Latvians to give blood from their hearts for freedom and willingness to defend liberty", and the white represents the purity of the Latvians and the peace. Latvia is a country in Europe (one of the Baltic States) that shares borders with Russia, Belarus, and Sweden. It is thought to be one of the greenest countries due to the fact that the majority of the country is covered with forests and over one fifth of the country's landscape are protected natural areas. These are home to 4 national parks, 42 nature parks, and 260 nature reserves. The forests in Latvia are often referred to as "Green Gold" as Latvia's economy relies heavily on them due to the timber and wood that they produce, making them the most important products in the country. The capital city of Latvia is called Riga. Lativa is a country that has been invaded and occupied by many different countries and over the 800 years, these countries included, Germany, Denmark, Sweden, Poland, and Russia. It was during the Soviet Union Rule, however, that the country suffered the most after they invaded in 1940 as they killed many Latvians or moved them to another country. During WW II (while it was still under the rule of the Soviet Union), over half of Latvia's Jews (12.5%) were killed by Nazi Germany making this the highest number of any of the European countries. Once the Soviet Union collapsed, Latvia was able to regain its independence in 1991. Latvia has become a very popular country for tourists, with many historic buildings and monuments, white sand beaches, and forests to visit. The country is home to over 12,000 rivers and 2,000 lakes. The Venta River is home to the "Venta Rapid" which is the widest waterfall that Europe has. The capital city of Riga is home to 800 art nouveau buildings which are a popular destination for tourists and it is also home to the Central Riga Market which is the largest one in Europe. Oh, we beseech thee to bless it!